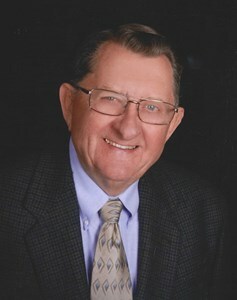 LYLE "GENE" EUGENE CUNNINGHAM, 81, passed away April 5, 2019 in Olathe, KS. He was born April 23, 1937 in Parsons, KS to Verdna Lavina( Bowman) and Lyle Frank Cunningham. On July 5, 1958 he was married to Elizabeth "Betty" O'Hara at St. Patrick's Catholic Church in Parsons, KS. Gene and Betty moved to Chanute, KS in 1965 and he was employed as a Marketing Group Representative for over 27 years with Blue Cross Blue Shield of Kansas, until his retirement in 1992. During his time with Blue Cross Blue Shield, he was the recipient of several awards and special recognitions. Following his retirement, Gene enjoyed helping at Cleaver Farm and Home Rental Store, golfing, helping a friend with his farming needs, and participating in his grandchildren's activities. Gene and Betty were also able to travel to all 50 states, and enjoyed traveling in their RV for more than 16 years. Gene was a proud 3rd and 4th Degree members of the Knights of Columbus, a lifetime member of the Elks Club and a member of Prince of Peace Catholic Church. Surviving family include his wife, Elizabeth "Betty", of the home, daughter Brenda (Marlyn) Swayne of Hays, KS, son Steve (Lisa) Cunningham of Olathe, KS., and six grandchildren: Michelle (Spencer)Swayne-Goff of Victoria, KS, Shannon Swayne of Glenwood Springs, CO, Samuel (Haley) Cunningham of Olathe, KS, Grace Albers of Norfolk, VA, Andrews Cunningham of Olathe, KS, Erin Albers of Muncie, IN, and two great-grandchildren, Mason and Aeris Goff of Victoria, KS. Gene is also survived by his brother Richard (Beth) Cunningham of Salina, KS. He was preceded in death by his parents, his daughter Debra Kathleen Cunningham-Albers, and his brother, Larry Cunningham. Visitation will be held Wed., April 10 from 6-8pm at Penwell-Gabel Funeral Home, Olathe, KS, followed by funeral mass on Thurs., April 11 at 11:00am at Prince of Peace Catholic Church, Olathe, KS. Committal services will be held on Thurs., April 11 at 4pm at Mount Olivet Catholic Cemetery, Parsons, KS. In lieu of flowers, memorials are suggested to the Prince of Peace Catholic Church Altar Fund. Add your memories to the guest book of Lyle Cunningham. We enjoyed traveling with you on bus trips. It was such a pleasure to hear his stories and to get acquainted with him and Betty at meals. He was a very down -to- earth sincere man. We send out sincere sympathy. Gene and Betty were my neighbors for many years. Gene was always willing to help if it was needed or not. I would come home from work and my front yard would be mowed. I would tell him he didn't need to do it and his reply was it was easier to mow two yards. I got a kick out of the "chicken wire cage" that he build to keep the squirrels and rabbits out of his tomatoes. He was a great neighbor and loved keeping busy. Even though I have moved, he will be missed. Hope he and my mother have a couple of laughs and share stories. You are in my thoughts and prayers, my sympathy to all.